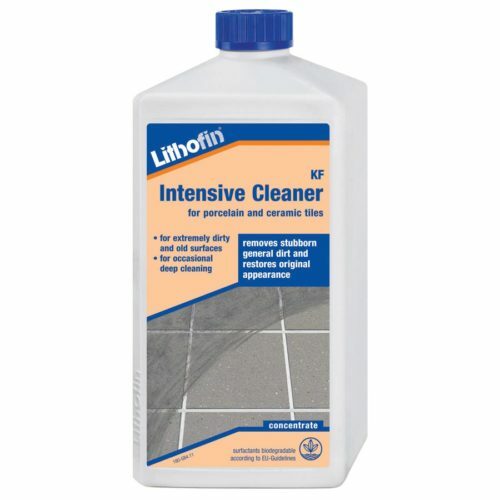 Mildly alkaline cleaner for removing rust stains and residues of metal oxide. The reactive compounds work on the rust and transform it into water soluble particles. The reaction becomes visible through a purple discolouration. The resulting particles can be rinsed off with water. 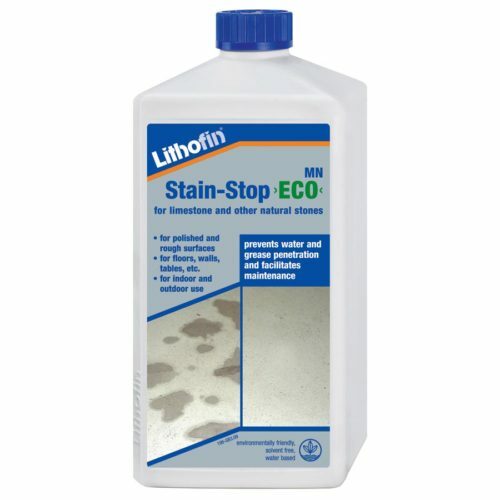 Lithofin Rust-EX does not change the appearance of the surface and can therefore be used on single stains. 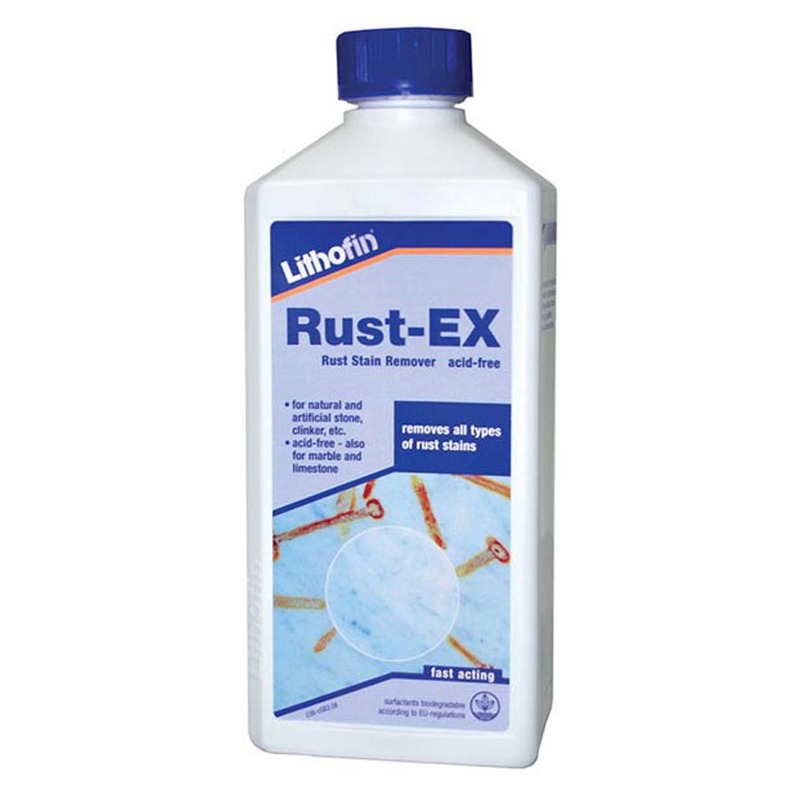 For removing all kinds of rust stains. Causes for these stains may be iron containing fertilizers, metal garden furniture, leaking heating systems, etc. Surfaces: suitable for all ceramic surfaces, marble, limestone, granite, gneiss, concrete and artificial stone. Generously apply undiluted product to the dry surface and distribute with a brush. A purple discolouration shows the start of the reaction. Allow to work for about 5 minutes, 10 minutes max! Do not allow product to dry. After working time, add water and a splash of Lithofin MN Power-Clean, brush and rinse off with plenty of water. Important: working time must not exceed 10 minutes. Repeat procedure in case of unsatisfactory results. 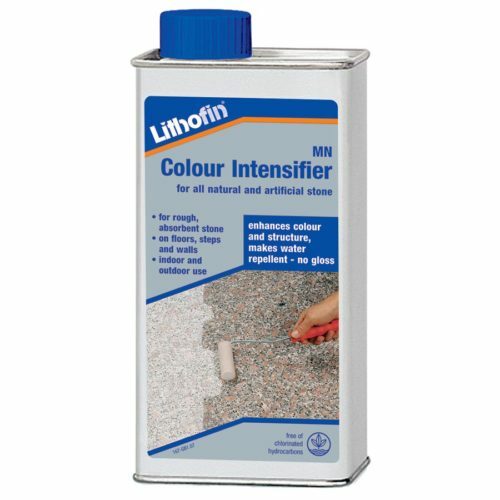 Ferrous natural stones as well as coloured concrete stones may change colour after treatment with Lithofin Rust-EX. Please Note: always try product in an inconspicuous area prior to use. Avoid contact with metal, varnish, wood, etc. Long working times on polished limestones may cause the surface to become slightly dull. The remaining light discolouration will disappear with time. Application Temperature: not below 15°C. Cool, dark and closed. Shelf life of up to 1 year. Product will turn purple with time. Disposal: dispose of product residues according to local regulations. Containers are made of environmentally friendly polyetylene (PE). Clean containers can be recycled through collection system. Ensure good ventilation during application. Label according to EU-Directive 1999/45/EG: Xn, harmful Risk and Safety Phrases: Harmful by inhalation and if swallowed. Irritating to eyes and skin. Keep out of the reach of children. In case of contact with eyes, rinse immediately with plenty of water and seek medical advice. If swallowed, seek medical advice immediately and show this container or label. First Aid Procedures: Remove contaminated soaked clothing immediately. In case of inhalation, ensure of fresh air. In case of contact with skin wash off immediately with soap and water. In case of contact with eyes rinse thoroughly with plenty of water and seek medical advice. In case of ingestion, do not induce vomiting. If swallowed by mistake drink plenty of water and seek medical treatment. Emergency Procedures: in case of spill or other release, take up with absorbent material (e.g. sand, sawdust, general-purpose binder). Product does not burn, fire-extinguishing activities according to surrounding. ADR2003/GGVSE: not a dangerous good.